1. Soak rice noodles in tap hot water till softened. Test some if chewy it is not ready. 3. Slice beef into very thin slices. 4. If using bicarb, mix into beef and leave for 30 minutes. 8. Fry onion in few tbsp of oil till slightly brown, add rice noodles and stir till hot add enough light soy sauce and continue stir frying for another 5 minutes. Do use a non stick pan, rice noodles will stick very easily. Take noodles out, cover and keep warm. 9. In a clean pan/wok, add 2 – 3 tbsp of oil, add ginger and garlic stir fry till fragrant. Turn heat right up add beef and stir fry till almost cooked through but still a little pink, add splosh of boiling water (about ¾ - 1 cup) to make a sauce. Taste to see if you need more soy or oyster sauce. Add ground pepper to taste. Thicken the sauce with slackened cornflour then lastly add spring onion. 10. 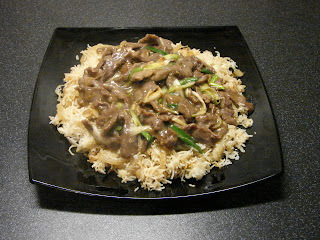 Spoon meat and sauce over rice noodles.